Well I didn’t actually make pickles… but I sure felt like I was living in Little House on the Prairie. I spent a solid five hours canning last night and got a paltry 4 pints of preserved goodies out of it. I can’t even imagine how long it would take to plan out EVERYTHING I needed to eat during the winter months and can it… woof. 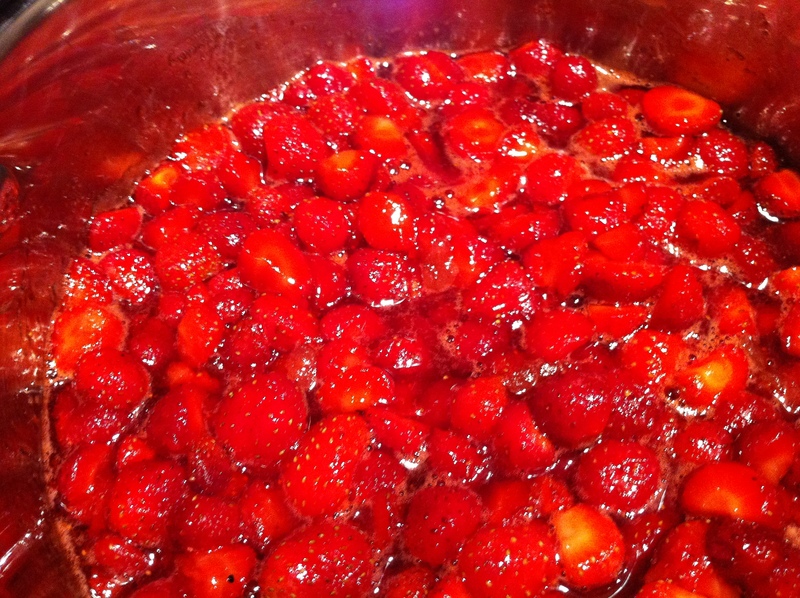 For my canning venture I decided on a very “simple” strawberry jam and spicy tomato sauce. Tomatoes and strawberries were so good this summer I can’t bear to part with them just yet. 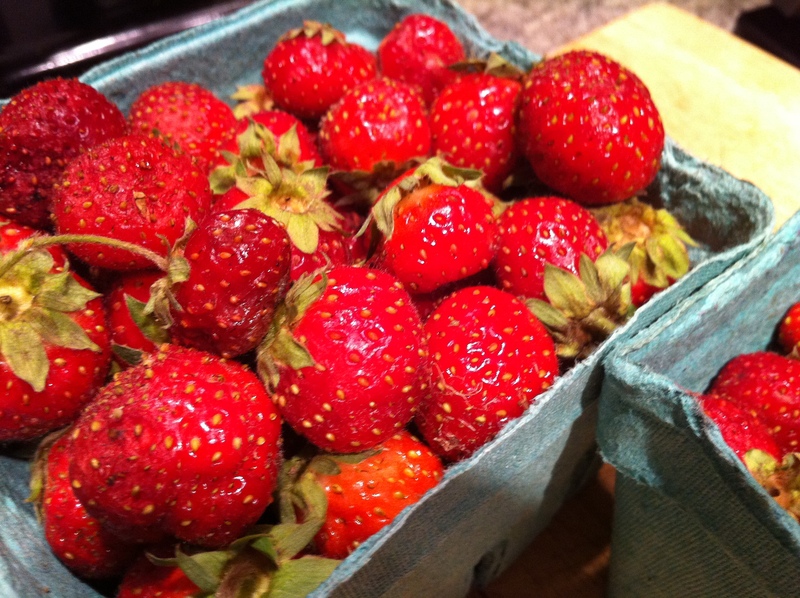 I bought my strawberries from Berried Treasures at the Union Square farmers market – they are cross-bred with wild strawberries so they very small and VERY delicious. Unfortunately hulling and halving these teeny tiny berries took me the better part of an hour. 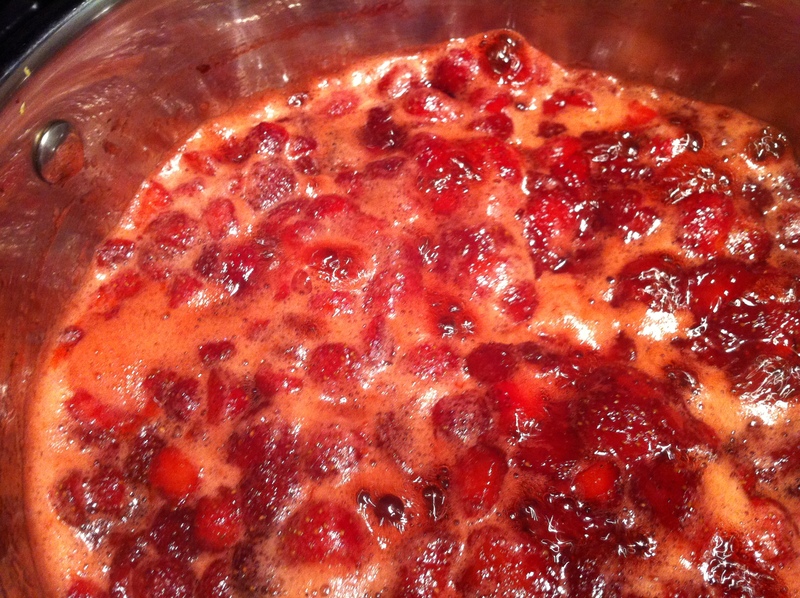 In a medium sized saucepan, combine the sugar and lemon juice/zest. Cook this over low heat until it liquifies. Cook this at a low boil until the jam gels when you pour a bit on something very cold — I put a spoon in my freezer to test it. This takes a good 30-40 minutes. When it is finished, pour it into washed and sterilized mason jars, seal and leave it out on your counter until you hear the top of the mason jar click in. Start out by peeling and seeding the tomatoes. Make an “X” at the non-stem end of the tomato, run it under hot water for a few seconds, then the skin should peel off nice and easily. 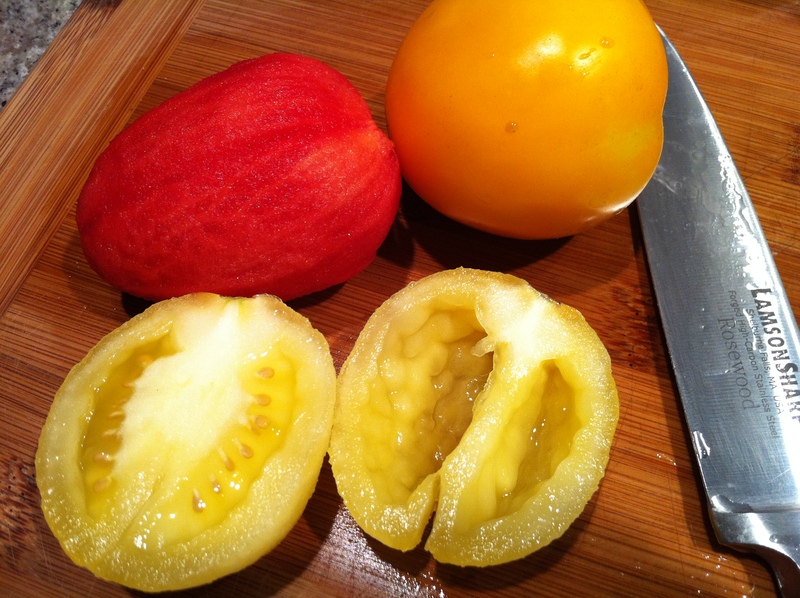 Chop the peeled tomato in half, and then in half again so you can scoop all of the seeds out. 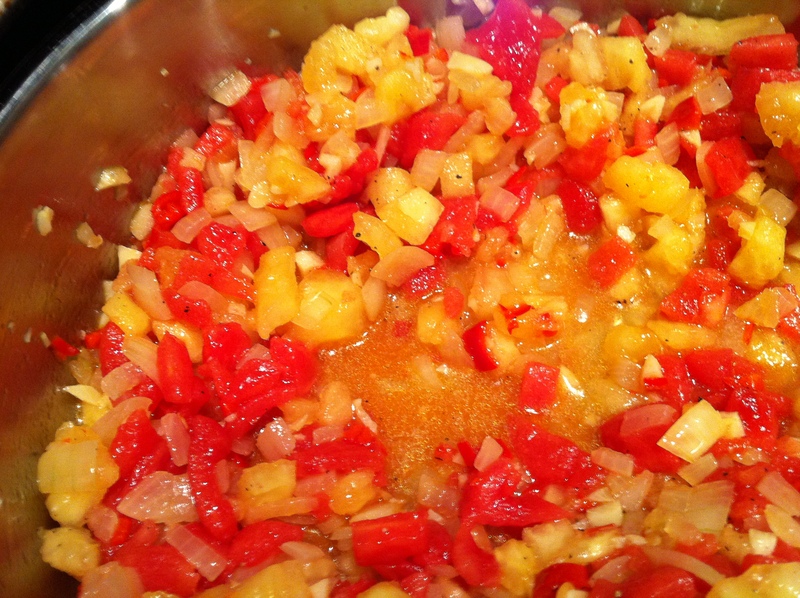 After you are finished with your tomatoes, dice the onions, garlic and hot pepper. In a large saucepan, saute the onion in olive oil for a few minutes until translucent. 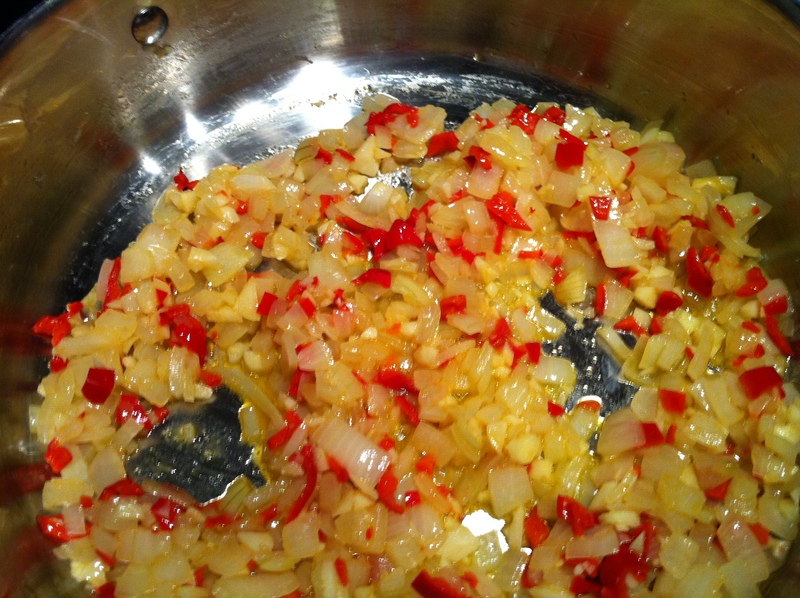 Then add the garlic and hot pepper and cook for a few more minutes. 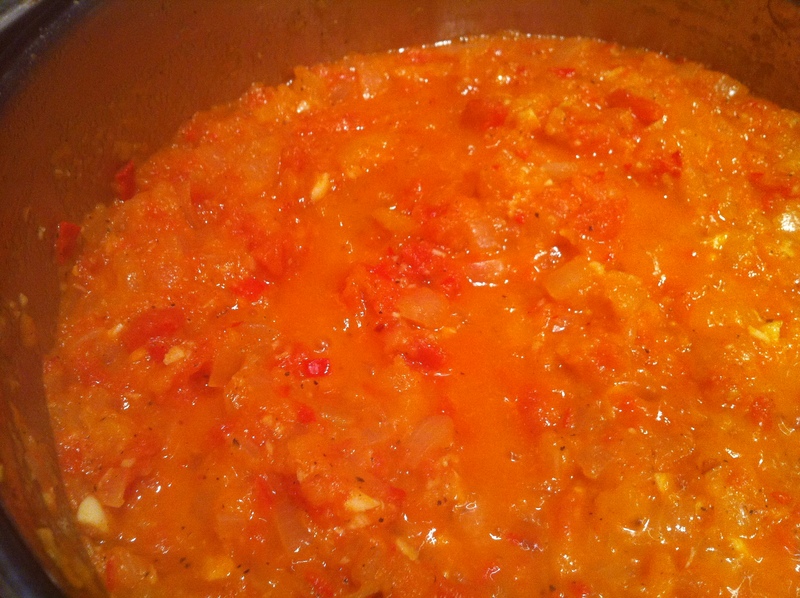 Add the tomatoes and wine and let this simmer for a good 30-40 minutes until the tomatoes start to break up. I used an immersion blender to puree about 3/4 of the sauce mixture. Taste the sauce and season with salt, pepper, and red pepper flakes. Mine ended up with quite a kick. In the same fashion as the jam, pour the sauce into washed and sterilized mason jars, seal and leave out on your counter until they are cool. 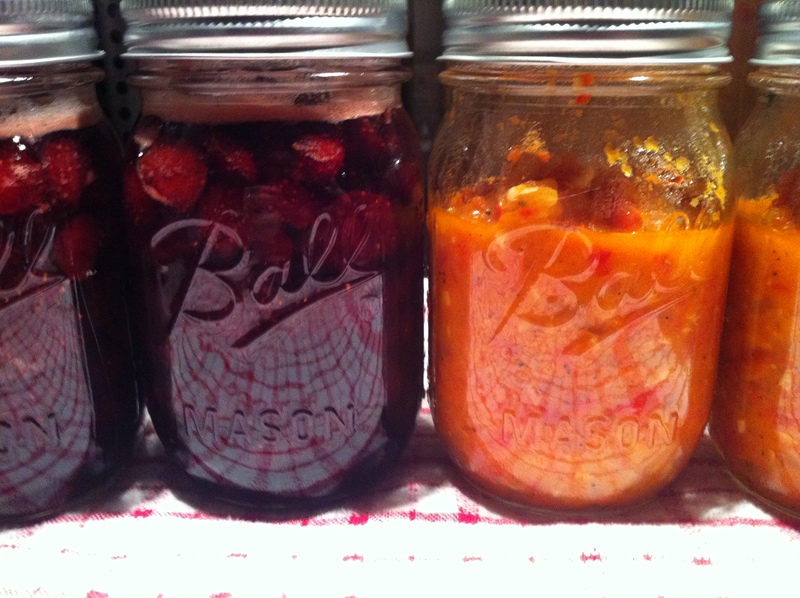 I ended up with about two pints of each — canning is VERY labor intensive, I have no idea how our forefathers managed to can everything under the sun before winter… I guess canning was more of a life or death situation back in the day. Hats off to them. This entry was posted in Berries, Canning, Farmers Market Finds, Garlic, Tomatoes and tagged canning, garlic, hot peppers, jam, mason jars, onions, strawberries, strawberry jam, tomato sauce, tomatoes. Bookmark the permalink. Hi, I’m a new follower and quite the foodie myself! I was wondering what you use this tomato sauce for? Let us know if you have any other questions and happy cooking!